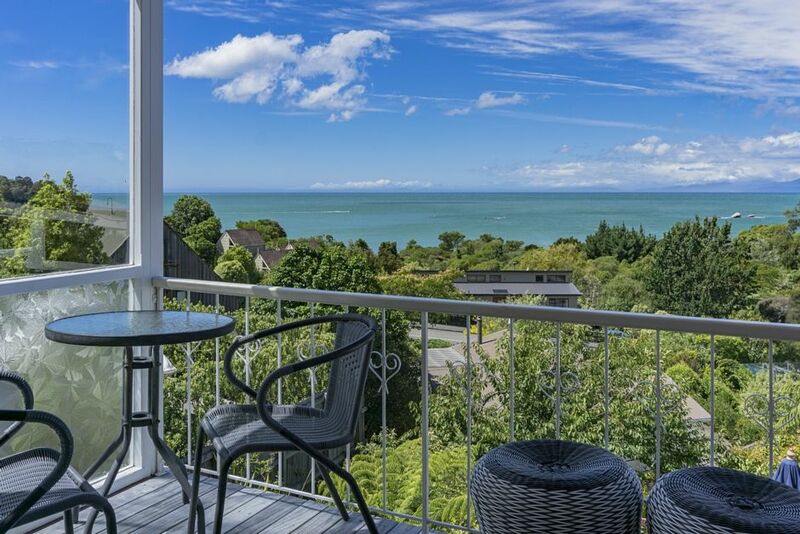 This is a lovely older style apartment with wonderful views of the ocean. A short 3 minute walk to the beautiful golden sand of Little Kaiteriteri Beach. Very comfortable with open plan layout. Nice decks to enjoy the views and sun. Close to the Mountain Bike Park and only a 10 minute walk to the shop, restaurants and activities. Abel Tasman National Park is only a short boat ride away. A 20 minute drive to the supermarket in Motueka. My wife and I had a lovely stay at this apartment. Communication with the owner was quick and easy, the views were fantastic, and we had everything we wanted. However, we would not recommend that a larger group stay here. The second and third bedrooms are reached by walking down an exterior staircase without a guard rail on one side (thus unsafe for small children), and they seem like converted storage rooms. Clean and tidy property.Well equipped kitchen, older style bathroom with a decent roomy shower.Nice linens on the beds. A welcome bottle of wine and flowers in a vase by the bed from the thoughtful owner who was just a phonecall away thankfully when we locked ourselves out! Access to downstairs bedrooms is by outside stairs and not suited to younger children.No downstairs toilet. In addition to the balcony for outdoor relaxing,at the bottom of the property is a deck with outdoor dining furniture and umbrella .Nice for meals in the evening once you have navigated the stairs! We had a perfect holiday .Lovely to revisit this area after 19 years. Good location within walking distance of Kaiteriteri beach. Good views. Comfortable bed and sufficiently equiped kitchen. Great location very short walk to main Kaiterteri Beach. You can either go by road or the scenic walkway. 5 minutes walk to the beach, excellent swimming.